Eiffel Tower- The iconic landmark of Paris receives nearly seven million tourists each year and is the symbolic heart of this beautiful city. The tower was built in the year 1889 for the World Exhibition (Paris Exposition). Constructed to mark the 100 years of The French Revolution, The Eiffel Tower is named after a French Civil Engineer whose name was Gustave Eiffel and often credited with its designing. For those , visiting France and particularly Paris, taking a tour to Eiffel Tower is a must and if you want to learn a bit more about it, just climb the stairs and reach the first floor which gives the glimpse of its history and a panorama of the beautiful city of Paris from the second floor . 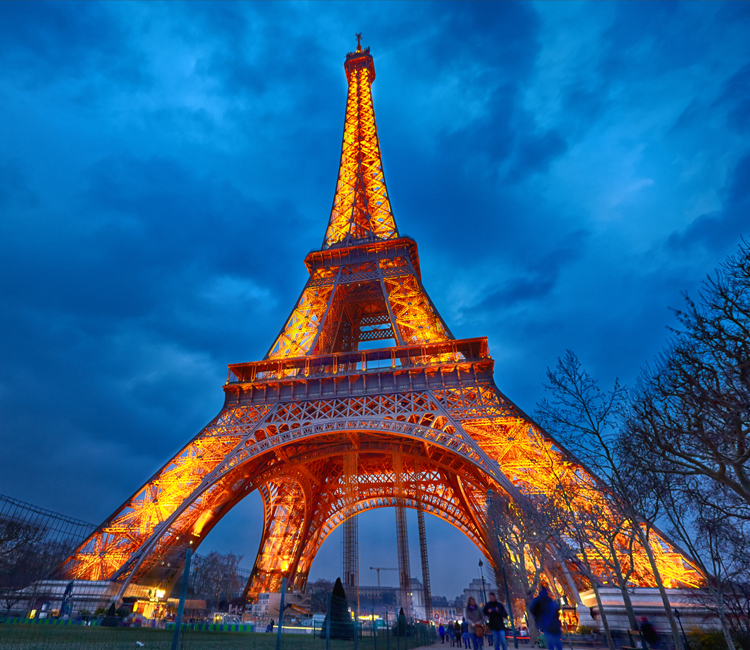 The best time to visit the Eiffel tower is undoubtedly at night when you can see the Paris illuminated in bright lights and the atmosphere is just so calm and magical with the Eiffel Tower being lit in thousands of lights. What to do Around Eiffel Tower? To make the best of your Eiffel Tower experience, you can enjoy a drink at the top of this stunning tower. You can have a chance to sip your choice of champagne while enjoying the night view of Paris from the high-altitude at the Champagne Bar located on the top floor of Eiffel Tower. The Bar generally opens until 10 p.m. in the night and offers the best of rose and white champagne, so get ready for a great experience if you happen to visit the tower at night. And not just this, you also can have the most pleasant and unforgettable experience with your beloved at Restaurant 58 located on the first floor of the Eiffel tower that serves the delicious food for lunch and dinner. Don’t forget to shoot a great video during your elevator ride to the top floor as the panoramic view outside and the beautiful interiors of the tower are worth capturing. Eiffel tower, surrounded by beautiful lush green laws where you can opt to sit and have cheese, wine and some classic French desserts during morning or noon. You can also click some great pictures near this iconic structure for carrying back home, some great memories or a quick bike tour by hiring a bike from the bike station for exploring the beauty around. So, make sure that you visit this awe-inspiring beautiful structure of Paris at both the daytime and night for some unique experiences. The 2nd floor is worth giving the most of your time as you can’t stop yourself clicking some great shots of Paris from there for your travel diaries. For your France Schengen Visa, you should contact any France Visa Agency in UK and pay the requisite France Tourist Visa Fees to get your France Visa Appointment on time. Make sure you apply your Visa several days before your scheduled trip to avoid any end moment delays and inconvenience as Visa application is a time consuming process.